The Computer plug-in is used to work with local computer’s file system. It can be used as both source of data and storage destination. Files and folders of the plug-in file system correspond to common files and folders. They support all attributes, such as file size, creation time, modification time, and other. The plug-in can back up open files, i.e. files that are locked by other applications. This is made with the use of the Volume Shadow Copy Service. If you want to back up open files, then you need to have this service running on your system. The Computer plug-in is the main way to back up local files and folders. In the Data Sources pane, click Computer in the Local or network drive group. The Select data... dialog will open. 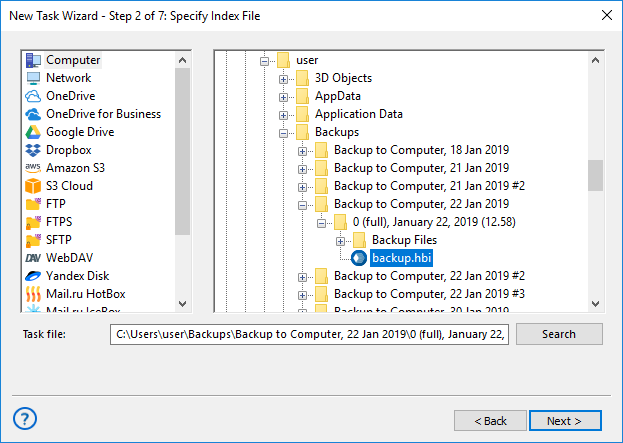 You can find more information about selecting data for backup in the Specify Backup Set chapter. Using the Computer plug-in as storage (i.e. 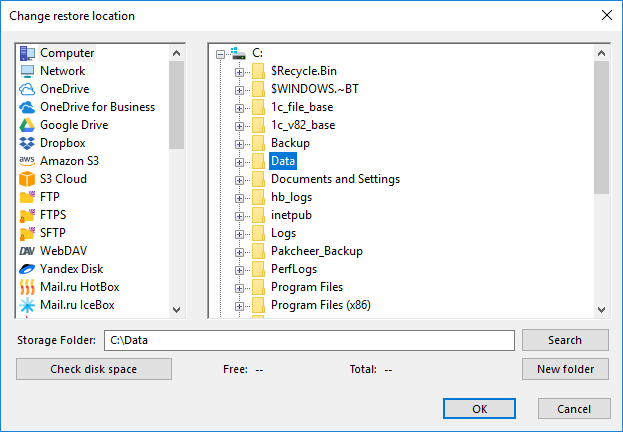 copying backups to a local folder) is made in a very straightforward way. 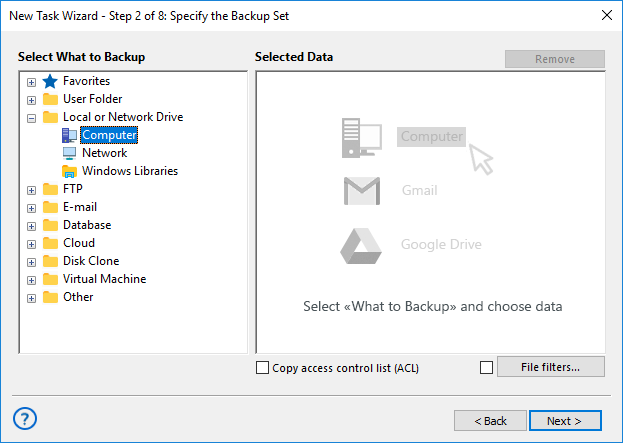 After selecting data for backup, you need to select destination. In the Storage Destinations pane, select Computer. Your local file system is displayed in the Folder Selection pane. In the Folder Selection pane, browse for a target folder. You can read general description of this step of the New Task Wizard in the Select Destination chapter. Browse for the index file (backup.hbi). 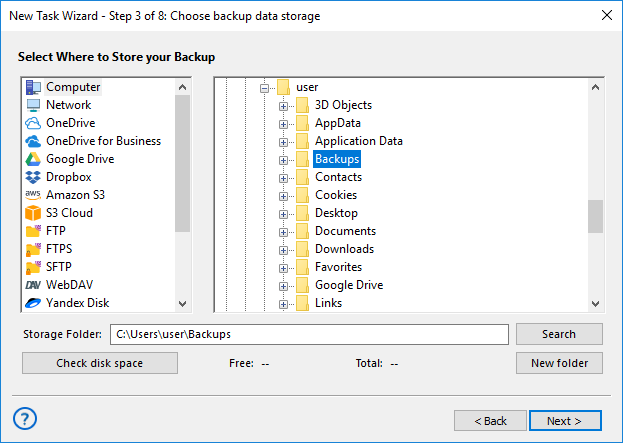 If your backups are located in a local file system, then you need to select Computer in the Storage Destinations pane to the left, and browse for the index file in the Index File Selection pane to the right. Click Next. If you are restoring backups of local files and folders, default path of restoration will have the Computer plug-in. 4.1. 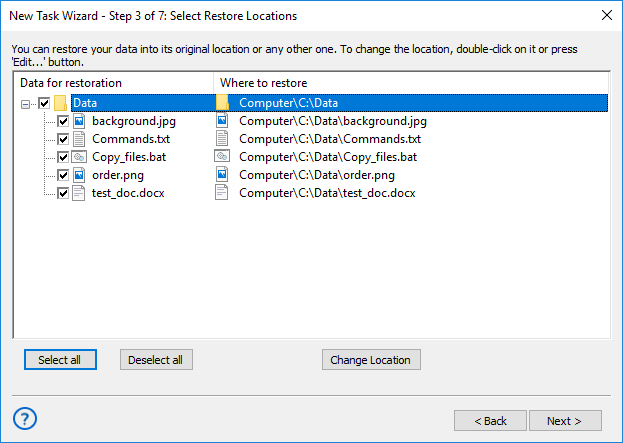 In the Select Restore Locations dialog, select a file or a folder, and then click Change Location. The Change restore location dialog opens. 4.2. 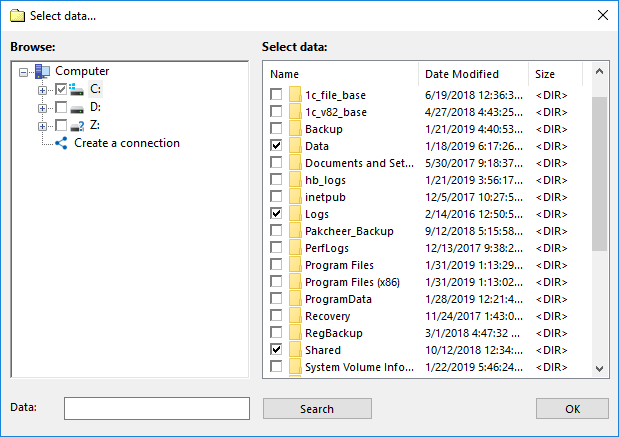 In the Change restore location dialog you can also select other file systems than the one provided by the Computer plug-in, e.g. FTP or WebDAV. Select a new location, and then click OK.
After verifying paths of restoration, you need to select type of restoration, enter decryption password (optional), and name the task. These steps are not specific to the Computer plug-in. To learn more, please see Restore Task.